Discovered by Pierre Méchain in 1781. 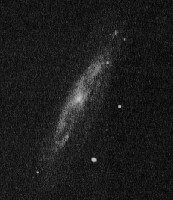 Messier 98 (M98, NGC 4192) is one of the faintest objects in Messier's catalog. It is a beautiful spiral galaxy seen edge-on, and a member of the Virgo Cluster of Galaxies, situated in the southern part of constellation Coma Berenices. Together with nearby situated M99 and M100, M98 was discovered on March 15, 1781 by Pierre Méchain. Charles Messier measured its position and cataloged it on April 13, 1781, immediately before finishing the third, final published edition of his catalog, and remarks that M98 is the faintest of these three. M98 is one of the more difficultly observable Messier galaxies in the Virgo Cluster, although it is situated in constellation Coma. Holmberg has speculated that M98 could be a foreground galaxy rather than a cluster member, because it is approaching us, at 125 km/sec. However, in the opinion of the present author, this is one of the strongest arguments that M98 is actually a Virgo Cluster member ! In the dense massive Virgo Cluster, both infall velocity and close encounters may have summed easily up to a motion of slightly more than 1200 km/sec, and this is apparently pointing in the direction toward us, by chance, resulting in the measure blue shift in the spectrum of this galaxy. M98 is nearly edge-on and displays a chaotic, diffuse disk, containing some blue regions of newly formed stars, and a huge quantity of occulting dust, which reddens considerably the light of the central small but bright nucleus. Edge-on spiral galaxy M98 can be best located by starting from the 5th mag star 6 Comae Berenices, which is east of M98.